Last month, I (and thousands of people on their email lists and Facebook group) began receiving emails that Six Figure Entertainment had formed a partnership with Therapy Cafe and would be hosting events there on an ongoing basis. Six Figure, which was founded in 2006, touts that it "is a major event and promotional company whose mission is to provide exemplary upscale social soirée for a mature and diverse audience." I have attended several of their events and will agree that they're usually upscale, but they're not usually diverse considering they draw a crowd of mostly African-American professionals--I would say about 95 percent. The group is planning their annual Cream & Butter Affair on August 21 at Ballantyne Village Theatre. 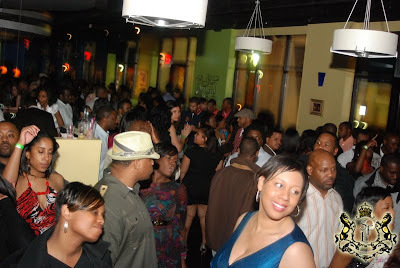 A photo from Six Figure Entertainment's Spring Couture, a late-night event held March 27 at Therapy Cafe. The success of the event led to SFE and Therapy's management partnering to hold events on a weekly basis. But back to the topic at hand, in June, SFE stated in the first of many emails that: "Six Figure Entertainment are now managing partners of Therapy Lounge Uptown Charlotte!!! Charlotte Get ready because we are about to bring you some Flavor in the Uptown Charlotte Area." Exactly one month later, that partnership has ended, according to a scathing email sent out this afternoon by Kirk Brown, CEO of Six Figure Entertainment. Below is that email in its entirety. Six Figure Entertainment (SFE) truly believes in providing our patrons with exceptional and quality events and value your views and opinions. The foundation of Six Figure Entertainment is focused on creating a unique blend of nightlife entertainment for a mature and diverse audience. Therefore, we regret to inform you that we will no longer be working with or supporting Therapy Café. We've also become aware of an undertone of racial insensitivity to the patrons of SFE as noted by many of you via the automatic addition of 20% gratuity to your bills. For your information, this occurred based upon the comments and attitudes of the management staff that "African-American People Don't Tip." If this were simply the attitude of the employees, our relationship could possibly be sustained through diversity training etc. ; however since this is the attitude of management it is best that we part company now. We do not condone and WILL NOT tolerate anyone disrespecting the brand of SFE and its patrons. At Six Figure Entertainment we place a lot of emphasis on our brand and the reputation of our company and as a result will not settle for anything less than the best. We ask that you refrain from supporting Therapy Cafe as we will no longer be in partnership with them. We do however ask that you continue to support Six Figure Entertainment in the events that we do provide to you here in the Queen City. DON'T SPEND YOUR BLACK DOLLARS AT THERAPY CAFE...IT IS WELCOMED BUT YOU AREN'T. Let's keep in mind that we haven't heard Therapy management's side of the story yet--Grown People Talking will try to get it and post it on this blog. And in lieu of all of the recent national news coverage of racial tension going on in the political arenas, allegations of racism shouldn't be made lightly or taken lightly. But what has been your experience at Therapy during the past month or even before SFE began its partnership? Post it in the comments. UPDATE: GPT was the first blog or news or web site of any kind to post this situation occurring between Six Figure Entertainment and Therapy Cafe. The same day I blogged about this, I tried contacting the managers/owners of Therapy to get their side of the story. After not much success, I decided to fall back and let the big boys handle it as over the next two weeks just about every major news outlet in Charlotte covered the story, from Creative Loafing to WBTV. One of the news sites that did the most thorough jobs covering it is QcityMetro.com. And if you were following the developments, you know that Therapy closed on August 10, less than two weeks after the allegations of racism surfaced. This weekend was my first time at Therapy. I did not experience any of the issues above. I was surprised at the 20% gratuity; however, it was less than I was going to tip. As an African American woman who frequents many establishments here in Charlotte, I can say that the lack of air conditioning, the over priced drinks, and the messy bathrooms are aligned with the other clubs/bars visited by African Americans. I stopped going to Therapy 3 years ago. I noticed that once the crowd became more African American, they began asking for a credit/debit card to hold a table before anyone even ordered. So...I'm kind of leaning toward believing Six Figure. I have not been there but I am in the business. Its hard because certain people dont respect the establishment nor TIP! 20% is reasonable for such a large crowd. Rest rooms can be kept clean if customers did not use the floors! IT is common to take the credit card when you are at a table. Many times, people run out. Its a business not personal!I dont know really what happened. I think its a business deal that went bad and the race card was played. I think that in Charlotte, black people use the "race" card to their advantage. I am a regular at Therapy, and everyone knows me. The staff is always friendly to anyone I see walk through the door. Restrooms are hard to keep clean when you have people who are disrespectful and don't know how to pick up after themselves. Also, I believe that more than likely only one person probably had an issue, got upset, and took it to a whole new level. Personally I am a server myself, I am not racist in any way, but it is common factor that black people do not tip. It's unfortunate but a stereotype has been made. Since you said that this is a large event, it makes since that gratuity would be added. In all restaurants, gratuity is added to a party of 8 or more. On the issue of negotiating prices, this is a buisness and you have to have the prices to where you will make money. I think that this was probably taken a step to far, and is hurting a good local buisness. I heard about Therapy being unfair to black customers about 2 years ago. Let's just say I havent attended in over 2 years. When SFE decided to partner with them I thought possibly they were under new management and was starting to take away the bad stereotypes put on young urban professionals. The reality is Therapy is wrong. 9 times out of 10, the people who are there are Professional. Meaning that we have jobs & are educated. It's not really business minded for Therapy to take no money at all and destroy a relationship not just w/ SFE but with the African American culture,than to get the money they charge people for anyway. So disgusted & Charlotte, will never prosper with this mentality. This wouldn't happen to be the same promoters that during a CIAA event wanted to collect their money from the door before they paid for the venue. Then screamed racism to the hundreds in line and in emails and web post when the club owners refused their entry without advance payment? Seeing as how 50 or 60 percent of Therapy's staff was african american, Id have to say this is probably a business deal gone bad. SFE should be ashamed of themselves. Just another race card dealt to the unlucky. Why hire a primarily African-American promoter if you do not wish to have that demographic present? Think about 40 or 50 people who lost their jobs today. Half of which are African-American. Anyone who believes this wasn't about money obviously isn't as educated as they believe. It is baseless allegations like these that are racist. we have been at therapy in the past with a group of 8 adults and 9 kids. they added in a 20% gratuity and we were a caucasian group. sorry to see things head south. I'm sorry, but adding gratuity (18-20% normally) is typical to large parties. And even if you are paying separately it makes things more simple. A friend of mine serves at an upscale restaurant and served a Panther player and his two women. Their tab was almost $200. He tipped $12. This is just another example of African-Americans playing the race card and expecting everything to be handed to them. I loved therapy...the drinks were always good, music was always good, the crowds unfortuantely were not always good. It saddens me to say that on more than one occasion I saw large parties of african americans make the waitresses cry and refuse to pay prompting police officers to be called out. Never in all my years did I see a white group or even a mixed group of people prompt this...Therapy was treated badly but still wanted to keep a relationship with our African American Community. I know SFE wronged them and know they have wronged others. SFE has to stop playing the race card and accusing others of being racist when they cant get the deals they want. You are ruining it for all those who dont want race to be an issue. Well, I was told that a few years ago the owner called an African American male the "N" word and was punched in the face by the male. So the comments about African-Americans not tipping does NOT surprise me. Unfortunately, the white General Manager interviewed in the Charlotte Observer is caught in the middle because his girlfriend is African-American; hence, of course he did not make the comment. I serve/cocktail uptown, during CIAA I averaged $5/hour. In a regular weekend I make about $20/hour. That is not racism; that's fact. The issue needs to be addressed. Why is there such a gap? It is not out of the norm to take a card when you reserve a table. As a matter of fact that recently became practice at other venues because of the frequency of people(black, white, green,orange etc) reserving a table for the night and not showing up. This has a disastrous affect on the servers potential to make money. It just sounds like the ppl who are complaining do not know much at all about the restaurant/bar industry. The nightlife downtown at most places is a very diverse crowd. At WR maybe not so much but def most every where else. Shame on the grown ppl crying about being treated poorly just because you're black.....don't they get it.....if anyone male,female,black,white....wants a fair shake in this world YOU HAVE TO STOP BEING A CRYBABY!!!! !CHARLOTTE happens to be known for one of the best places to live for African Americans to pursue their careers sucessfully. The complainers are just plain ignorant to how businesses run and when they feel slighted in any way they are so quick to make a federal issue of it.